The country has a rich artistic tradition, with distinct creative forms that encompass music, dance, and the visual arts. Sri Lankan culture is internationally associated with cricket, a distinct cuisine, an indigenous holistic medicine practice, religious iconography such as the Buddhist flag, and exports such as tea, cinnamon, and gemstones, as well as a robust tourism industry. Sri Lanka has longstanding ties with the Indian subcontinent that can be traced back to prehistory. Sri Lanka's population is predominantly Sinhalese with sizable Sri Lankan Moor, Sri Lankan Tamil and Indian Tamil minorities. Sri Lanka has a documented history of over 2,000 years, mainly due to ancient historic scriptures like Mahawamsa, and with the first stone objects dating back to 500,000 BC. Several centuries of intermittent foreign influence has transformed Sri Lankan culture to its present form. Nevertheless, the ancient traditions and festivals are still celebrated on the island, together with other minorities that make up the Sri Lankan identity. One very important aspect that differentiates Sri Lankan history is its view on women. Women and men in Sri Lanka have been viewed equal for thousands of years from ruling the country to how they dress. Both men and women had the chance to rule the land (Which is true for even today. The world's first female prime minister, Sirimavo Bandaranaike, was from Sri Lanka. Even though clothing today is very much westernized and modest dressing has become the norm for everyone, ancient drawings and carvings such as 'Sigiriya art', Isurumuniya Lovers show how the pre-colonial Sri Lankans used to dress, which shows identical amount of clothing and status for men and women. The architecture of Sri Lanka displays a rich variety of architectural forms and styles. 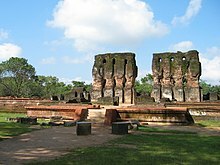 Buddhism had a significant influence on Sri Lankan architecture, since it was introduced to the island in 3rd Century BCE. Techniques and styles developed in India, China and later Europe, transported via colonialism, have also played a major role in the architecture of Sri Lanka. Many forms of Sri Lankan arts and crafts take inspiration from the Island's long and lasting Buddhist culture which in turn has absorbed and adopted countless regional and local traditions. In most instances Sri Lankan art originates from religious beliefs, and is represented in many forms such as painting, sculpture, and architecture. One of the most notable aspects of Sri Lankan art are caves and temple paintings, such as the frescoes found at Sigiriya, and religious paintings found in temples in Dambulla and Temple of the Tooth Relic in Kandy. Other popular forms of art have been influenced by both natives as well as foreign settlers. For example, traditional wooden handicrafts and clay pottery are found around the hilly regions while Portuguese-inspired lacework and Indonesian-inspired Batik are also notable. Sri Lanka is home to a variety of dance styles including classical, folk and dance drama. The two single biggest influences on Sri Lankan music are from Buddhism and Portuguese colonizers. 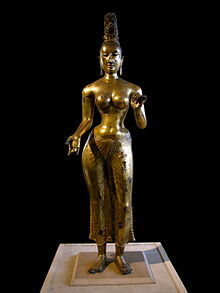 Buddhism arrived in Sri Lanka after the Buddha's visit in 300 BC, while the Portuguese arrived in the 15th century, bringing with them cantiga ballads, the ukulele, and guitars, along with African slaves, who further diversified the musical roots of the island. These slaves were called kaffrinha, and their dance music was called baila. Traditional Sri Lankan music includes the hypnotic Kandyan drums - drumming was and is very much a part of music in both Buddhist and Hindu temples in Sri Lanka. 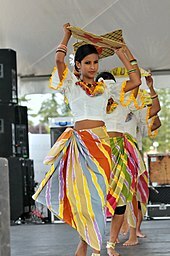 Most western parts of Sri Lanka follow western dancing and music. The movie Kadawunu Poronduwa (The broken promise), produced by S. M. Nayagam of Chitra Kala Movietone, heralded the coming of Sri Lankan cinema in 1947. Ranmuthu Duwa (Island of treasures, 1962) marked the transition cinema from black-and-white to color. In recent years, Sri Lankan cinema has featured subjects such as family melodrama, social transformation, and the years of conflict between the military and the LTTE. Their cinematic style is similar to Bollywood movies. In 1979, movie attendance rose to an all-time high, but a gradual decline has been recorded since then. Undoubtedly, the most influential and revolutionary filmmaker in the history of Sri Lankan cinema is Lester James Peiris, who has directed a number of movies which received global acclaim, including Rekava (Line of destiny, 1956), Gamperaliya (The changing village, 1964), Nidhanaya (The treasure, 1970), and Golu Hadawatha (Cold Heart, 1968. )There are many cinemas in the city areas. The cuisine of Sri Lanka is primarily influenced by that of Southern India, Indonesia and the Netherlands. Rice is a staple and usually consumed daily, and it can be found at any special occasion, while spicy curries are favourite dishes for lunch and dinner. A very popular alcoholic drink is toddy or arrack, both made from palm tree sap. Rice and curry refers to a range of Sri Lankan dishes. Sri Lankans also eat hoppers (Aappa, Aappam,) which can be found anywhere in Sri Lanka. Much of Sri Lanka's cuisine consists of boiled or steamed rice served with spicy curry. Another well-known rice dish is kiribath, meaning milk rice. Curries in Sri Lanka are not just limited to meat or fish-based dishes, there are also vegetable and even fruit curries. A typical Sri Lankan meal consists of a "main curry" (fish, chicken, or mutton), as well as several other curries made with vegetable and lentils. Side-dishes include pickles, chutneys and "sambols" which can sometimes be fiery hot. The most famous of these is the coconut sambol, made of scraped coconut mixed with chili peppers, dried Maldivian fish and lime juice. This is ground to a paste and eaten with rice, as it gives zest to the meal and is believed to increase appetite. In addition to sambols, Sri Lankans eat "mallung", chopped leaves mixed with grated coconut and red onions. Coconut milk is found in most Sri Lankan dishes and it gives the cuisine its unique flavor. Sri Lanka's urban areas are host to American fast food corporations and many of the younger generation have started to take a liking to this new style of cuisine, although it is rejected by many, particularly the more traditional elder members of the community. Restaurants serving Indian and Chinese cuisine are popular and found throughout the country. Sri Lanka has long been known for its spices. The best known is cinnamon which is native to Sri Lanka. In the 15th and 16th centuries, spice and ivory traders from all over the world brought their native cuisines to the island, resulting in a rich diversity of cooking styles and techniques. Lamprais rice boiled in stock with a special curry, accompanied by frikkadels (meatballs), all of which is then wrapped in a banana leaf and baked as a Dutch-influenced Sri Lankan dish. Dutch and Portuguese sweets also continue to be popular. British influences include roast beef and roast chicken. Also, the influence of the Indian cooking methods and food have played a major role in what Sri Lankans eat. Sri Lankans use spices liberally in their dishes and typically do not follow an exact recipe: thus, every cook's curry will taste slightly different. Furthermore, people from different regions of the island (for instance, hill-country dwellers versus coastal dwellers) traditionally cook in different ways. Sri Lankan cuisine is known to be among the world's spiciest, due to the high use of different varieties of chili peppers referred to as amu miris (Green chilli), kochchi miris, and maalu miris (capsicum) and in Tamil Milakaai, among others. It is generally accepted for tourists to request that the food is cooked with a lower chili content to cater for the more sensitive Western palette. Food cooked for public occasions typically uses less chili than food cooked at homes, where the food is cooked with the chili content preferable to the occupants. Tea is served whenever a guest arrives, it is served at festivals and gatherings. The Sinhalese and Tamil New Year ("Aluth Avurudhu" in Sinhala, "Puthiyathandu" in Tamil) is a very large cultural event on the island. The festival takes place in April (also known as the month of Bak) when the sun moves from the Meena Rashiya (House of Pisces) to the Mesha Rashiya (House of Aries). Unusually, both the end of one year and the beginning of the next occur not at midnight but at separate times determined by astrologers with a period of some hours between (the "nona gathe" or neutral period) being a time where one is expected to refrain from all types of work and instead engage solely in relaxing religious activities and traditional games. During the New Year festivities, both children and adults will often dress in traditional outfits. But the clothes must be washed and very clean because it should be pure. * Public holiday, † Bank holiday, # Mercantile holiday All full-moon days are Buddhist holidays referred to as Poya. The actual date on which a particular Poya day will fall changes every year. The Buddhist community of Sri Lanka observes Poya Days, once per month according to the Lunar calendar. The Hindus and Muslims also observe their own holidays. Sri Lankans are considered to be very religious, with 99% of polled individuals saying religion is an important part of their daily lives. The history of the island has been involved with religion numerous times. There are many Buddhist temples in Sri Lanka which date back to antiquity. In the middle of the temple, there is an old Boho tree. It is known that once lord Buddha had meditated here, so in honour of Lord Buddha, people walk around the tree with pure water. After 4 rounds, they pour the water on the tree where Lord Buddha meditated. When they walk around the tree, they pray. The trees are worshipped heavily. The religious preference of an area could be determined by the number of religious institutions in the area. The Northern and Eastern parts of the island have several notable Hindu temples due to the fact that the majority of the population living in these areas are Tamil. Ethnic conflict has severely affected other communities living in these areas during the times of LTTE strife. Many churches can be found along the southern coastline because of former Roman Catholic and Protestant colonial heritage. Buddhists reside in all parts of the island, but especially in the south, the upcountry, and the western seaboard. Buddhists are the largest religious group in Sri Lanka. While the Sinhalese people speak Sinhala as their mother tongue, the Tamil people speak Tamil. English is also widely spoken. Sinhala is spoken by about 17 million people in Sri Lanka, more than 14 million of whom are native speakers. It is one of the constitutionally recognized official languages of Sri Lanka, along with Tamil. Sports plays a very important part in Sri Lankan culture. The most popular sport in Sri Lanka is cricket, and as such, there are many cricket fields scattered across the island for children and adults to play the sport. A popular pastime of the Sri Lankan population, after playing cricket, is watching the Sri Lankan national team play. It is common for businesses to shut down when very important matches are televised. This was the case in 1996, when the Sri Lankan team beat Australia in the finals to win the Cricket World Cup. The whole country was shut down, although there was a curfew imposed upon the whole island. After the 1996 Cricket World Cup triumph of the Sri Lanka national cricket team, the sport became the most watched in the country. However, in recent years, the politicians and the businessmen getting into the sport has raised many concerns. Volleyball is the national game of Sri Lanka. Birds hold a special place in Sri Lankan culture. Villagers maintain a nest at their home for home sparrows. Sparrows are believed to bring luck when residing in your home. The most popular bird in Sri Lanka is the peacock, the sacred bird of the God Kataragama. Gira Sandeshaya (Parrot Message), Hansa Sandeshaya (Swan message), Mayura Sandeshaya (Peacock Message), Salalihini Sandeshaya (Myna Message) are pieces of ancient literature. There exist numerous stories about birds, society and people. Birds are considered to be sacred and local gods are believed to have travelled on them. The King Ravana story involved a wooden air craft called Dandu Monara (Wodden Peacock), in which he flew to India to abduct Seetha causing a war among Rama and Rawana. The National symbols of Sri Lanka are the symbols that represent the country and its people within Sri Lanka and abroad, and these also represent the country's traditions, culture, history and geography. The national symbols of Sri Lanka are the national anthem, national flag, national emblem, national flower, national tree, national bird, national butterfly, national gemstone and national sport. They were picked up and officially announced at various times. There are also several other symbols that do not have official acknowledgment or announced as national symbols, but are considered as national symbols at the local level. Tourist numbers are high in Sri Lanka- in March 2014 133,000 tourists visited. As with any influx of tourism there are of course a number of negative influences that can arise. Sri Lanka’s natural areas have, for instance, been affected by increased pollution with discharges into the sea and natural habitat loss, as well as the depletion of natural resources, which have arisen because of excessive water use in hotels, golf courses and swimming pools - which consume unnaturally large amounts of water. In response to this, the Department of Forest Conservation (Sri Lanka) and the Department of Wildlife Conservation (Sri Lanka) have instigated a number of protected areas of Sri Lanka - there are currently 32 forests under their protection - and in total - a little over 25% of the island is now a protected area. Emerging trends in the tourism industry in Sri Lanka points the way to tourists seeking more traditional experiences over conventional ideals such as tours and resorts. Consequently, these tourists seek out cheaper accommodation where they can be exposed to authentic villages and richer and more rustic experiences - this gives indigenous identities a chance to be preserved and not overtaken as tourism takes hold in the more remote areas, with Sri Lankan indigenous people taking their place as a part of the attraction for tourists and are thus protected and provided with support. Part of Sri Lanka’s post-conflict development process is to build on the ever-growing tourism industry - this has meant refurbishing hotels, building new hotels and the country-wide revival of traditional handicraft industries, as well as traditional cultural displays - such as traditional dances of Sri Lanka, like the Kandyan Dances (Uda Rata Natum), Low Country Dances (Pahatha Rata Natum), Devil Dance, and Folk Dances which are now a common sight in hotels and villages that are keen to entertain tourists with traditional and ‘authentic’ cultural displays. Because of this, much of the modernization of the tourist industry is taking place in and around the capital Colombo, with one-thirds of the estimated 9000 new hotel rooms being built in Sri Lanka in 2013, concentrated in the Colombo area. This kind of construction comes at a cost though - with a number of environmental concerns - the most pressing of which is Deforestation in Sri Lanka. In the 1920s, the island was almost 50% (49%) covered by trees but by 2005 this number had already fallen by 20%. The most badly hit area is the northern tip of the island - largely due to pre-existing environmental protection schemes in the south of the island. This is not all because of tourism, but also because of making way for new developments - hotels and resorts, and much of Sri Lanka’s forests have been removed to make way for agricultural land and plantations (especially tea plantations, which require a substantial amount of land) to provide fuel and timber. An area where excessive building of hotels has already caused problems is Yala - where there are serious concerns about too many visits of the Yala National Park. Though a more positive side to the influx of tourists can be seen at the Esala Perahera festival in Kandy - which has grown substantially in size over the years, incorporating colorful parades and processions into what was already one of Asia’s most prolific religious festivals. Traditional cultural dress is also rising in popularity - with chic hotels using formalized versions of traditional costume for their hotel staff, and foreigners marrying in Sri Lanka are incorporating traditional dress codes into their wedding attire. Henry Parker (author), British engineer who studied and compiled the oral tradition of Sri Lanka. ^ Mendis, V.L.B (1985). Foreign Relations of Sri Lanka: Earliest Times to 1965. Tisara Prakasakayo. p. 113-16. ^ "The Mahavamsa - Great Chronicle - History of Sri Lanka - Mahawansa". mahavamsa.org. Retrieved 8 April 2018. ^ "LANKALIBRARY FORUM • View topic - Home and family in ancient and medieval Sri Lanka". Lankalibrary.com. 21 December 2008. Retrieved 29 June 2012. ^ Winks, Robin (21 October 1999). "The Oxford History of the British Empire: Volume V: Historiography". OUP Oxford. Retrieved 8 April 2018 – via Google Books. ^ Saldin, B. D. K. (8 April 1996). "Orang Melayu Sri Lanka Dan Bahasanya". Sridevi Printers Publication. Retrieved 8 April 2018 – via Google Books. ^ Atkinson, Brett (8 April 2018). "Sri Lanka". Lonely Planet. Retrieved 8 April 2018 – via Google Books. ^ "Tea Culture in Sri Lanka – Kuoni Travel". @KuoniTravelUK. Retrieved 12 July 2018. ^ Melton, J. Gordon (13 September 2011). Religious Celebrations: An Encyclopedia of Holidays, Festivals, Solemn Observances, and Spiritual Commemorations [2 volumes]: An Encyclopedia of Holidays, Festivals, Solemn Observances, and Spiritual Commemorations. ABC-CLIO. ISBN 9781598842067. ^ Inc., Gallup,. "What Alabamians and Iranians Have in Common". Gallup.com. Retrieved 12 July 2018. ^ a b "The World Factbook — Central Intelligence Agency". www.cia.gov. Retrieved 12 July 2018. ^ "Cricket in Sri Lanka". lanka.com. Retrieved 12 July 2018. ^ LTD, Lankacom PVT. "The Island". www.island.lk. Retrieved 12 July 2018. ^ "Wild Life". www.infolanka.com. Retrieved 12 July 2018. ^ "The identity of Mother Lanka". Sunday Observer. 29 January 2012. Archived from the original on 16 February 2015. Retrieved 1 December 2014. ^ Wimalaratne, K D G (2013). National Symbols Of Sri Lanka. Sri Lanka: Sarasavi Publishers. ISBN 9553101194. ^ a b Travels, Elegant. "Indigenous People of Sri Lanka - Travel Sri Lanka". www.travelsrilanka.co.uk. Retrieved 8 April 2018. ^ "Tourism Research and Statistics - Sri Lanka Tourism Development Authority". www.sltda.lk. Retrieved 8 April 2018. This page was last edited on 20 March 2019, at 09:39 (UTC).